On the assumption that the Aussies do not "throw the baby out with the bath water" (i.e. sack experienced First staff) they should start out OK. The bigger risks for them are how they deal with the unions and what pension liabilities they pick up. These are the issues that "did for" Macquarie at ELBG along with a hopelessly overpriced deal in the first place! Comment I have seen elsewhere suggests that the Tower Transit garages are the ones with the poorest profitability so the new owners may have the bigger struggle on their hands if they need to start making a return quickly. Anything to do with Harry? To be fair to Quality Line, they only major route they run is the X26. Buying up routes like the 23 and 25 is rather entering in at the deep end of London bus operations. That's not to say they'll be a total failure, just that they'll probably have a tough time. The 23 and 25 together alone outnumber the PVR of EB. Having dug around some more seemingly not. There seems to be confusion between similarly named groups in Australia. There is Transit Australia Group (TAG) that did have a link to Harry Blundred. He ran a firm called Sunbus that TAG bought out. Harry did not stay with the group - he retired to the South of France. This group owns a bus manufacturing company as well as running buses. The group buying part of First London is Transit Systems Australia that seems to have grown out of smaller businesses based in Western Australia. No Harry Blundred link that I can find. It also runs ferries. You have to wonder if it fancies taking a stab at river services too. I am intrigued as to where the inspiration for the trading name "Tower Transit" came from!! I've spoken to a couple of mates who work at First and both of them are actually looking forward to the takeover. I've only got their word but it would seem that the current First garage structure is fairly management heavy and could do with a wheat/chaff investigation. My personal experience of such was moving from London General to Arriva - LG had managers for everything and anything all fighting to keep their jobs whilst Arriva run at about half the weight of managers and simply choose competent people to do the jobs (at Norwood anyway). It will be interesting to see quite how involved the new owners become in their new purchase, a lot of people gave Comfort Delgro six months when they took Metroline over but they've certainly proved themselves over the last few years. Tower Transit may yet become a power to behold! No need for intrigue. I believe all of their bus businesses have the word "Transit" as the suffix. I am sure someone has posted somewhere that the current London office is near Tower Bridge. Therefore "Tower Transit". Whether I have worked it out correctly I am sure we shall find out in due course. Had a quick search. 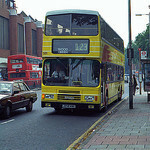 Tower Transit, Basingstoke is a coach hire company.